Werner's Cairns blog: The Aussie barbecue, operated by men! It's the only type of cooking a "real" man will do. When a man volunteers to do such cooking, the following chain of events is put into motion. 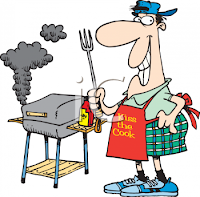 3 The woman prepares the meat for cooking, places it on a tray along with the necessary cooking utensils, and takes it to the man, who is lounging beside the grill, drinking a beer. 10. The man asks the woman how she enjoyed "her night off." Australian Barbie V American BBQ.. Click here. Yep, you hit the nail on the head that’s exactly how it is and so it will always be, Werner.